Turned out cute! The E is from 8CP's Happy Birthday font, which was appropriate since this was a birthday gift. :) My intention was to put a specific "round number" of pieces of candy in the jar, but Ms. Elaine isn't old enough to fill the jar with Hershey Kisses! So instead she got nearly two bags worth. Just a tip, go get yourself some Mint Truffle Kisses. Yummy! The red shirt is a design pairing I have used before and really liked! 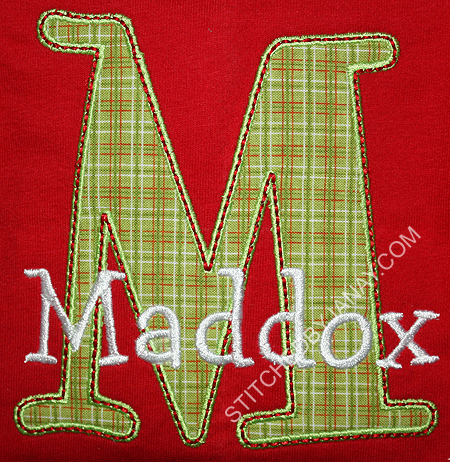 The applique M is from Embroidery Boutique's Cute Alphabet. I used Cleopatra from 8 Claws and a Paw to stitch his name. The whole monogram is way too wide, and it's not very balanced. So I decreased the width of the Ms to 70%, keeping the height the same. 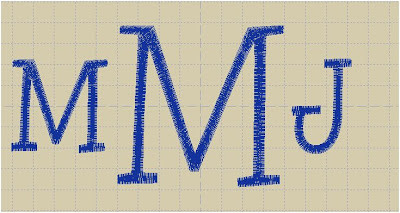 Then to make the width of the satin stitches match better, I increased the pull compensation of the first M and decreased the pull compensation of the J. I was pleased with the results! 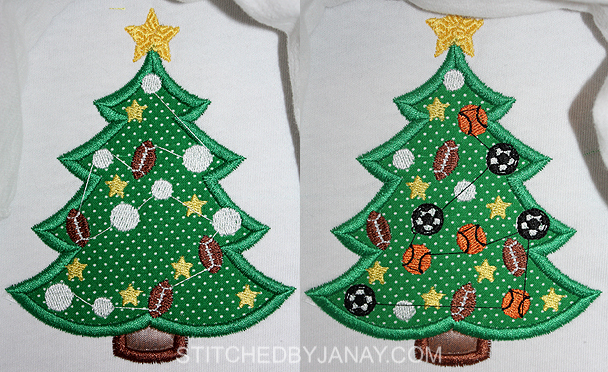 I love using well digitized designs in software I can trust -- it stitched perfectly! 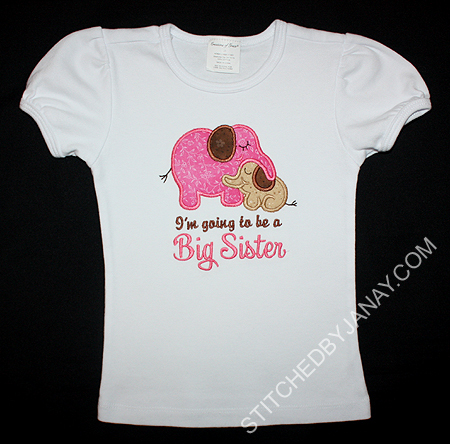 I was recently asked to make a shirt for a little girl to wear while visiting extended family to announce some big news... she's going to be a big sister! 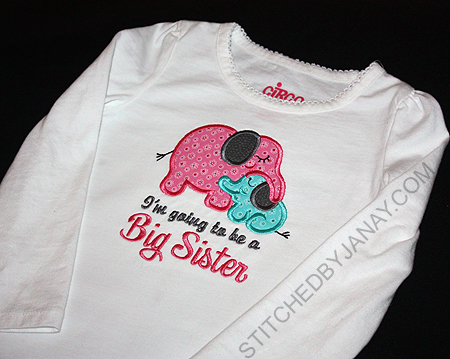 When the mom mentioned her daughter was really into elephants, I knew exactly which design to use, the elephant pair in Designs by JuJu's Roly Poly Elephants set. I used Embird Alphabet #7 for the first line, and 8CP's Dancer for Big Sister. Concurrent to the above project, another friend asked for a Big Sister reveal shirt. BUT my poor friend Brittany has been so sick that there was no way they could keep the pregnancy a secret to reveal at Thanksgiving and the news got out. 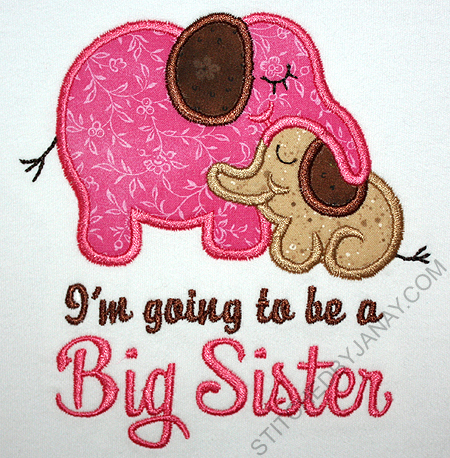 We lost the urgency and making a "big sis to be" shirt got pushed to the back burner. 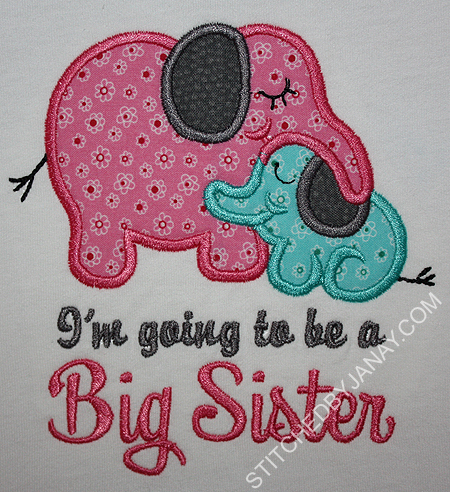 That turned out to be ok because last weekend they found out the baby is a boy, so I was able to make the little elephant blue on Kendal's shirt! :) Same design, different color scheme, so cute! 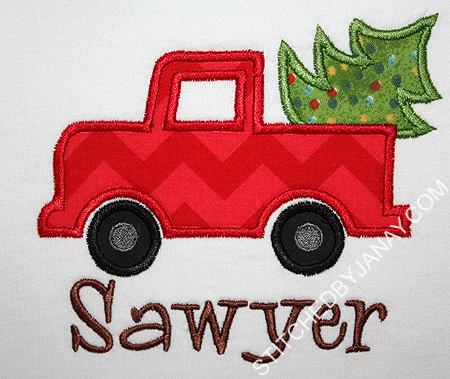 She picked Applique Market's Truck with Tree design, and I added his name with my all time fave 8CP's Whoa Nelly. 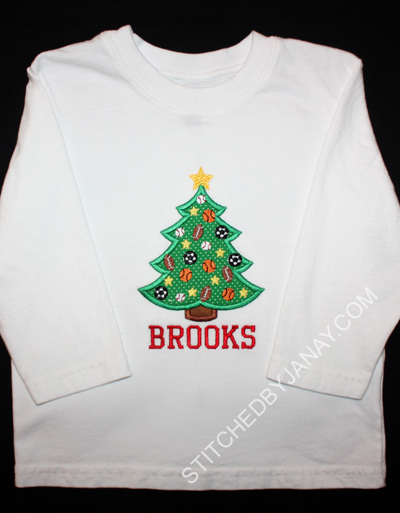 Like last year, I have made a couple of holiday shirts for Brooks! 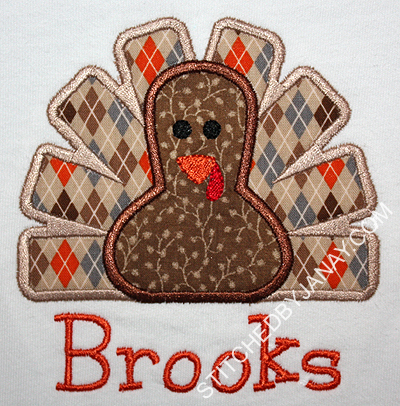 This is Appliqué Momma's Turkey 12. Love this tiny argyle print. I used Cubed from 8CP to add his name. 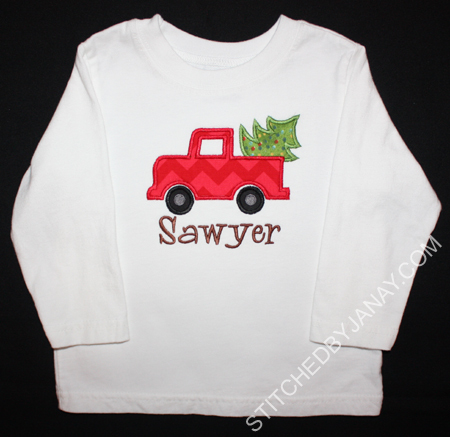 Isn't this cute for a boy?! 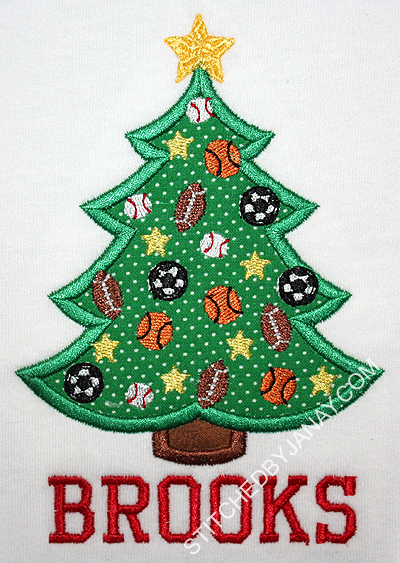 This is Lynnie Pinnie's All-Star Christmas tree. I used 8CP's College Block Small font to add his name. I love that font, it's one of my favorites to use with sporty designs! Ok, in a design with this much detail, thread changes and jump stitches are inevitable. 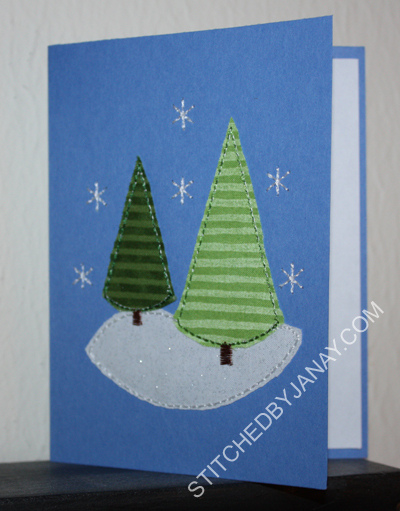 What I love most about Lynnie Pinnie designs is how efficient and user friendly they are. 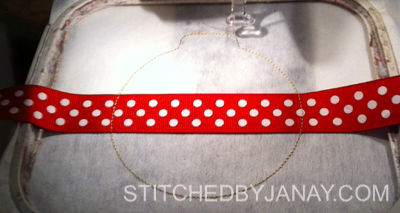 I took a couple pictures in the midst of stitching to show you what I mean. The left shows that all the footballs were finished and all the baseballs and soccer balls were started on the same step. The right shows that the soccer balls and basketballs were finished on the same step. 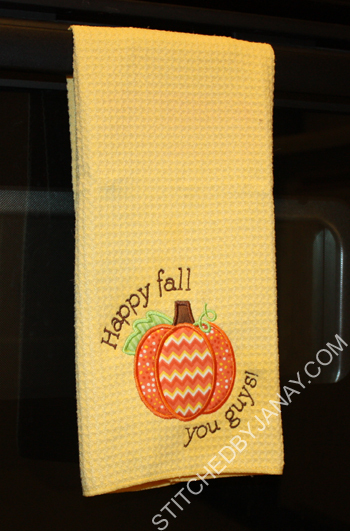 I finally used one of the colored microfiber towels I bought the first week of October. 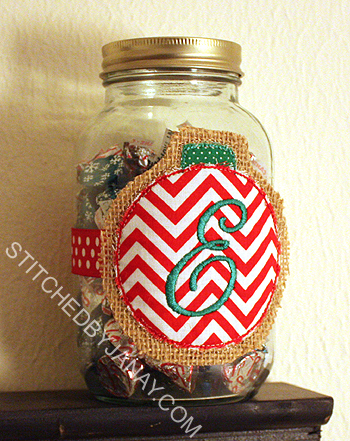 I finally used this cute chevron from Hobby Lobby. 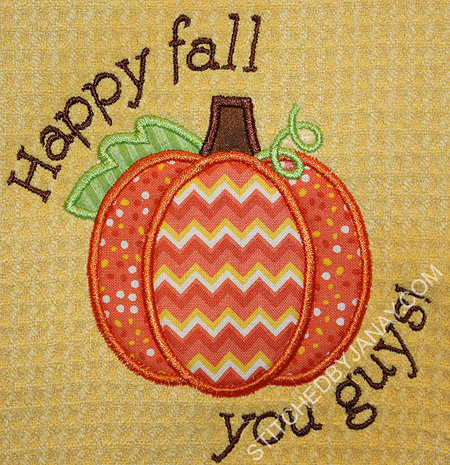 I finally used this adorable Pumpkin Applique from She Sew Chic that I *had* to have (even though I own a ton of pumpkin designs already). And yes, in a mere six days I'll be getting out my Christmas towels. But I finally got this done, and it will be waiting for me next fall! 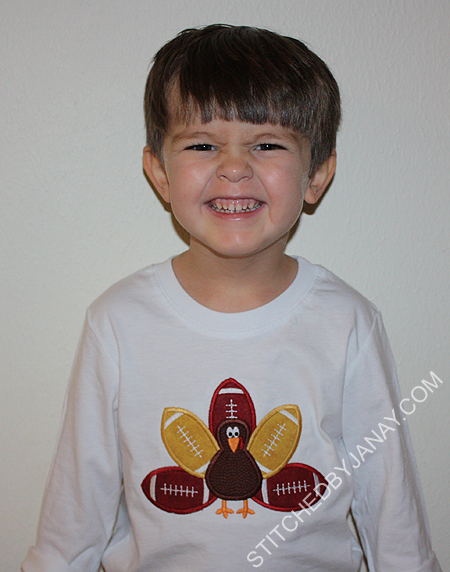 Let's start right off the bat with the cute kid, who is in the stage where "smile" means "crinkle your face as much as possible"
I got the design that day, but his turkey shirt from last year still fits, so I started to talk myself out of it. But then yesterday I saw a really cute shirt using the design and decided at the last minute to make it after all, so glad I did! There are two versions of this design. 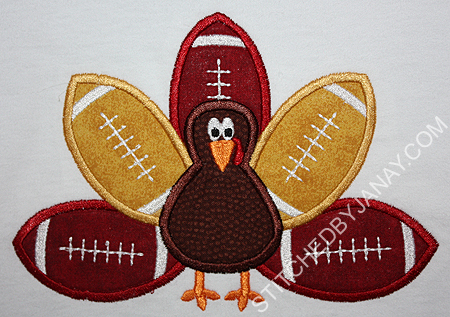 One has all the football feathers the same color so you can use brown fabric for traditional footballs. 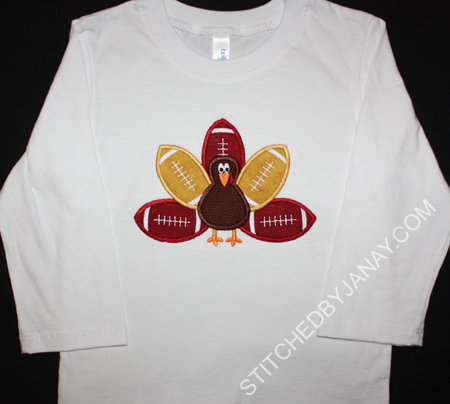 OR you can get this design that allows you to use your favorite team colors for the football feathers. So clever! Go Noles! 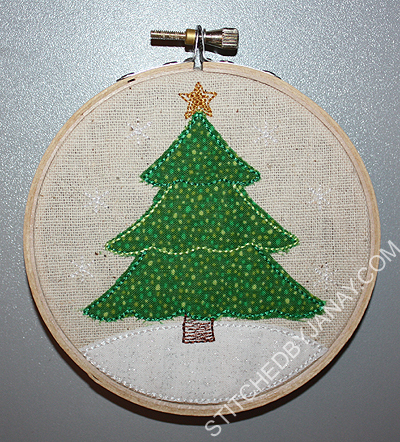 Simple Designs for Ornaments and More! There are benefits and drawbacks to being a member of an active applique group, and one of those is getting sucked into a craze! Even though it cost me a couple late nights, I'd say overall this time it was a benefit! 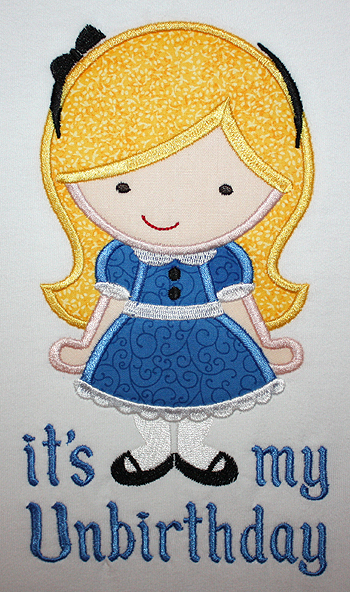 New from Lynnie Pinnie, simple little applique designs that are intended to be quick stitching and put inside a small embroidery hoop! Since I only bought two of these little hoops (for now, I'll be hunting more down) I decided to try a different medium. 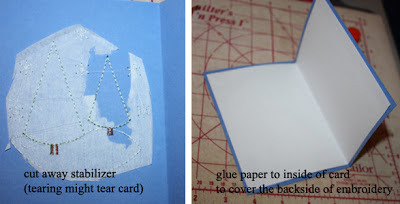 I have seen Hallmark cards with fabric stitched on them, and of course I'm always drawn to them but never buy one because I think, "I could do that!" 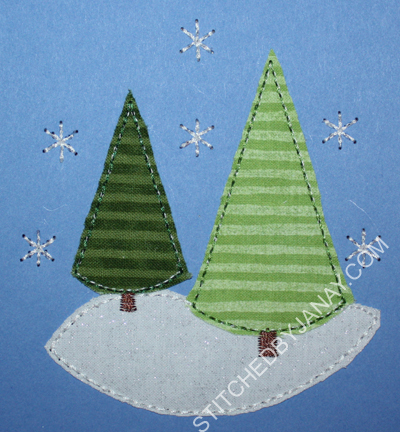 This is the 4" version of the Trees and Snow Applique for Little Hoops design. Here are a few random things I have done for my family recently. Confession -- I am a T-shirt and jeans girl. Always have been, always will be. 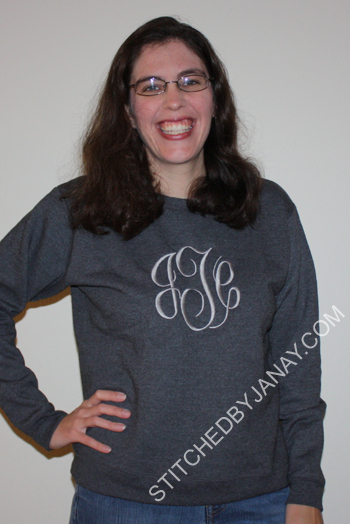 Maybe putting a big monogram on a sweatshirt will dress me up a bit! Even this picture isn't all that accurate. If you see me wearing my new digs, I guarantee my hair will be in a ponytail! This is Master Circle from Monogram Wizard. A friend digitized it for me (thanks Kristie!). 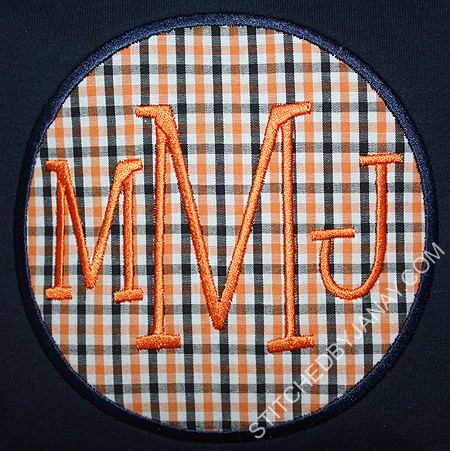 Now that I know what a 6" monogram looks like in person, the Fancy Circle Monogram from Itch 2 Stitch is definitely on my wish list. 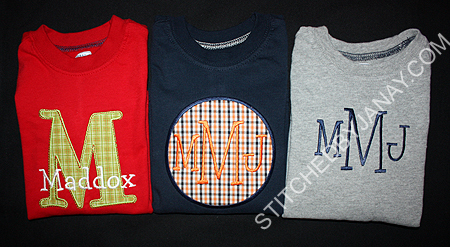 The nice thing about monogramming myself is that I can break all sorts of monogramming rules. 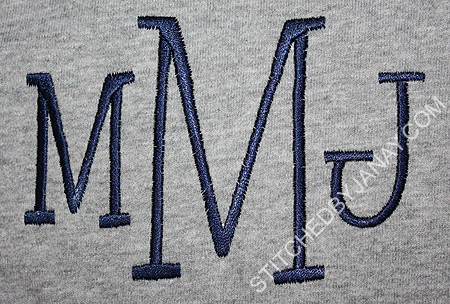 I've been doing embroidery for over 5 years and this is only the second time I've done my 3-letter monogram. (First time was on my fall rag bag.) 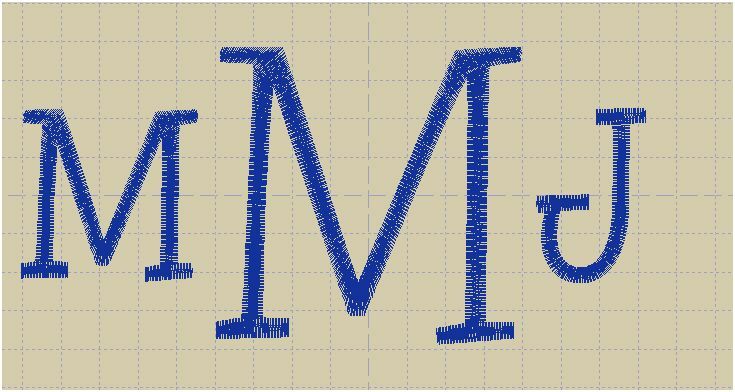 I go by my middle name, so I'm not a fan of my traditional first/LAST/middle monogram. Don't get me wrong, Mom, I love my name :) I'd just rather not have to have multiple conversations about why there is a K on my shirt. Plus the left J is always so much prettier than the right! So I opted for middle/LAST/maiden. Love how it turned out! I'm seriously considering adding a tone-on-tone monogram to every blank shirt in my wardrobe now. 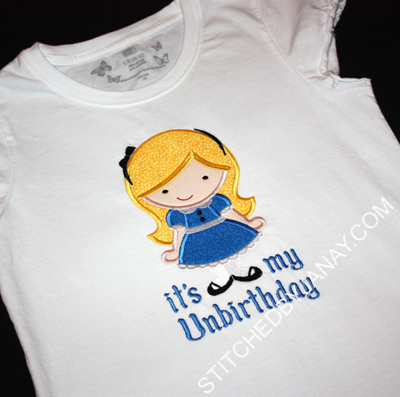 I made a shirt for Annaliese that is appropriate to wear 364 days a year! 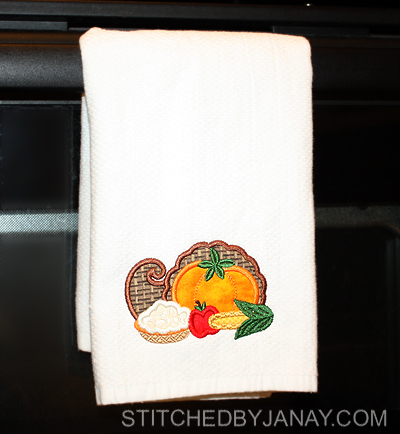 Don't you love this cornucopia design (also from LP)? 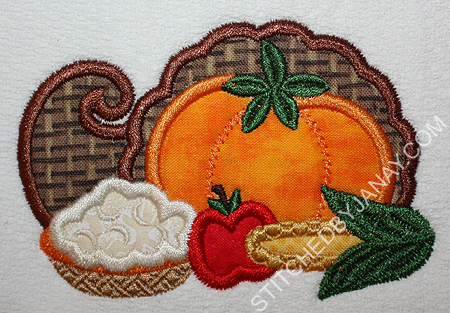 I love all the detail in the stitching (leaves, pie pan, satin stitches around the corn). I had fun picking fabrics for this!